The killing by Ukrainian law enforcement of a notorious ultranationalist wanted for war atrocities is a sign of an emerging rift in the new leadership in Kiev that illegally seized power in a coup last month, a senior Russian lawmaker said Wednesday. MOSCOW, March 26 (RIA Novosti) - The killing by Ukrainian law enforcement of a notorious ultranationalist wanted for war atrocities is a sign of an emerging rift in the new leadership in Kiev that illegally seized power in a coup last month, a senior Russian lawmaker said Wednesday. Olexander Muzychko, a member of Ukraine's radical Right Sector party and an active participant in this year's anti-government riots in Kiev, was gunned down late Monday in western Ukraine in an operation by law enforcement. A senior source in Ukraine's security service told RIA Novosti that Muzychko was killed by special forces operating as police officers. "The incident with Muzychko is just the beginning," Alexei Pushkov wrote on his Twitter blog. 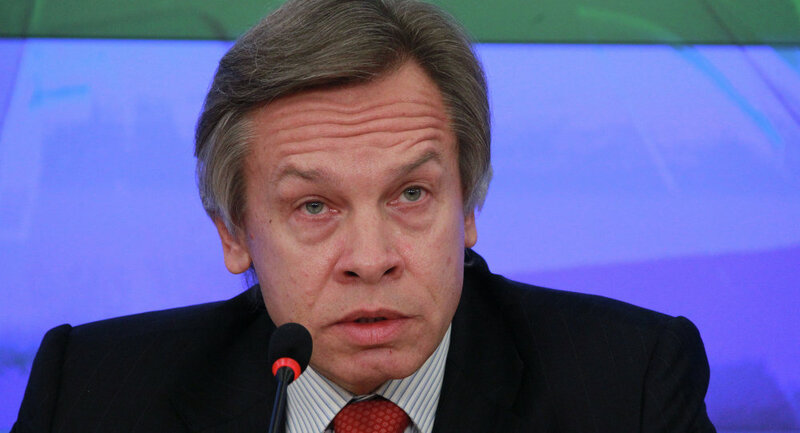 Pushkov, who heads the foreign affairs committee in the lower house of Russia's parliament, predicted further cracks in the alliance in Kiev: "This is how an upheaval works. Let's wait for news." On Tuesday, an official at Ukraine's Interior Ministry said Muzychko, also known as Sashko Bilyi, was killed by return fire shortly after an attempt to escape through a window. During the operation to arrest him he opened fire on law enforcement. Earlier this month, Muzychko accused Ukrainian prosecutors and police of a plot to capture or kill him in a video posted on YouTube. Muzychko was put on an international wanted list on suspicion of torturing and murdering at least 20 Russian servicemen in Chechnya in the early 2000s. After surfacing in Ukraine, he was arrested in absentia by a court in southern Russia earlier this month. Right Sector, along with Muzychko, is a major ally of the neo-Nazi Svoboda party led by Oleh Tyahnybok, a member of the new Ukrainian government and an active promoter of the ideas of Stepan Bandera. Bandera, a Ukrainian who collaborated with Nazi Germany during World War II, was involved in mass atrocities in the wartime ethnic cleansing of Poles, Jews and Russians. Russia has described last month's uprising in Kiev as an illegitimate fascist coup, which resulted in Moscow taking steps to protect ethnic Russians in Ukraine. Earlier this month, Russian Foreign Minister Sergei Lavrov railed against attempts to justify the actions of the neo-Nazis and their accomplices.